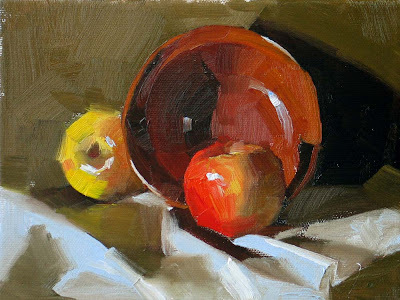 I just came back from Mexico yesterday and this is another demo painting I did at the workshop. I want thank Mrs. Isabel Deblanc for organizing this successful and unique workshop. We had artists from Canada, England, Germany, Mexico, The Netherlands, USA, and China. What an international group it was. I want to thank all of you for coming, and hope to see you again. Ajijic is a very beautiful place. I saw striking colors everywhere. I really need to practise my landscape painting skills and hope to generate some landscapes paintings from the photo I took in the future. Hola World! I am at beautiful Ajijic Mexico giving a workshop. This is a demo I did yesterday. My today's class starts now. I will talk to you later. Chao! When I setup this group, the green vase was rolling. 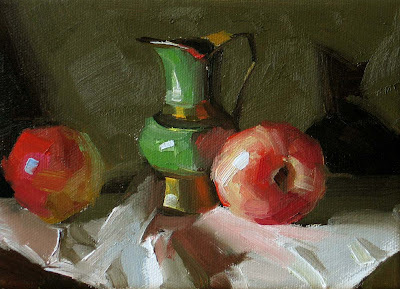 The black vase and the apple came as stoppers and established the stability. In this world we all need other people's support. 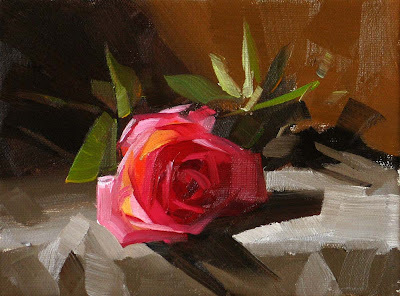 As a painter, I am very grateful to have the support from my collectors, and my fellow artist friends. Thank you!!!!!! I don't remember I have announced this workshop, and I am sorry for the late notice. 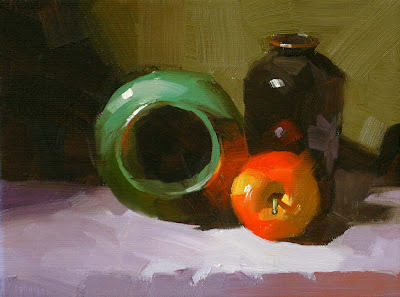 I am going to teach a 3-day still life painting workshop on October 11 – 13 at Rolling Fork, Mississippi. Artist Pat Walker is organizing this workshop at a beautiful place full of nature and wildlife. We still have several openings left. Please check Pat’s website and contact her to get more detailed information. I hope to see you and paint together with you. I have got so many responses on my post yesterday about naming a painting. Oh boy, I have learned a lot, both linguistically and culturally. Thank you'l so much, partner (got to sound like a Texan). You know I have lived in America for more than 20 years, but English has never been stopping challenging me, but I am grateful that people are very nice to me and tolerating my broken English. Meanwhile, I also got quite a few international messages. Art is a dramatic thingy. I am making friends all over of the world. "Another Rose" - What a boring name it is. I am not good at naming my paintings you can tell. I admire some of my fellow daily painters who can generate really exciting names for their work. If you have some tips, please help me out. I found this float in a park the other day and was attracted by its vibrant fluorescent colors. 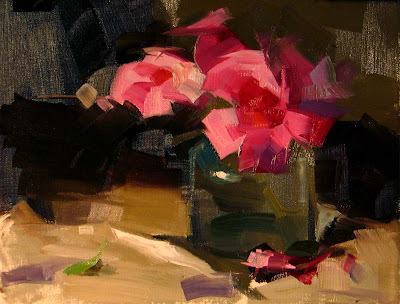 It gives a wonderful texture contrast against the metal pot in this painting. 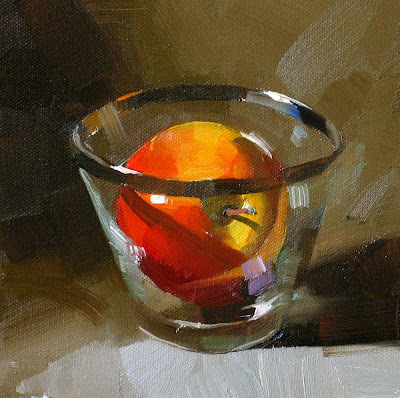 Plastic items usually give an impression of cheapness, and not every artist likes to paint them. Well in some cases, they do have a position in art. Next time my wife going shopping, I will ask her to buy me a rubber ducky. 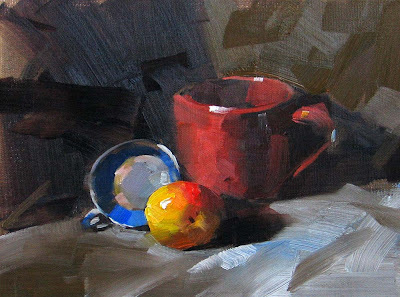 I have violated the cardinal rule of composition by placing my painting object exactly at the center of the canvas, but I think the painting will still work because of asymmetrical background and light distribution. I hope you can enjoy the drama of the light with this supper simple setup. I have spent last several days working on this gallery level painting. 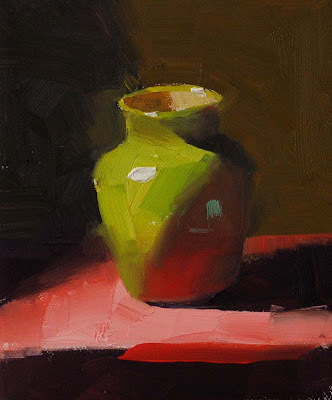 I really like this colorful vase and I have painted it many times. I think it is from Mexico. In two week, I will go there and give a workshop. Knowing almost nothing about this country, I am excited for this trip. I am pretty sure it will be fun to gain new experiences. 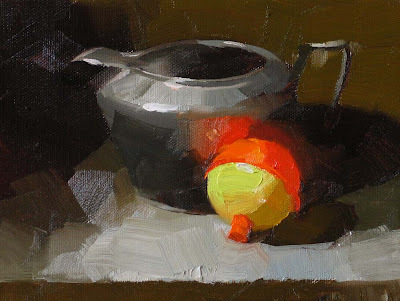 Actually, the bowl in this painting is not made of iron, but I like the rusty color. The Iron Bowl has several meanings. To most of Americans, especially Alabamians, Iron Bowl is a football game. I don't know much about football, but I did live in Alabama for seven years. To most of Chinese, especially the Mainlanders, iron ball symbolizes the job security, because iron bowl can not be broken so it will provide food with no end. The logic is a little shaky, but you have got the idea. At this difficult economic time, an iron bowl is surely good to have. I was informed by the Riverbend Gallery today that there is an article about me showing on a newspaper. Please check Lake Country Life page 6 for details. I am really happy to see my art growing healthily, and I am even happier to see my work make you happy.